Interview with the Doggie Dojo! 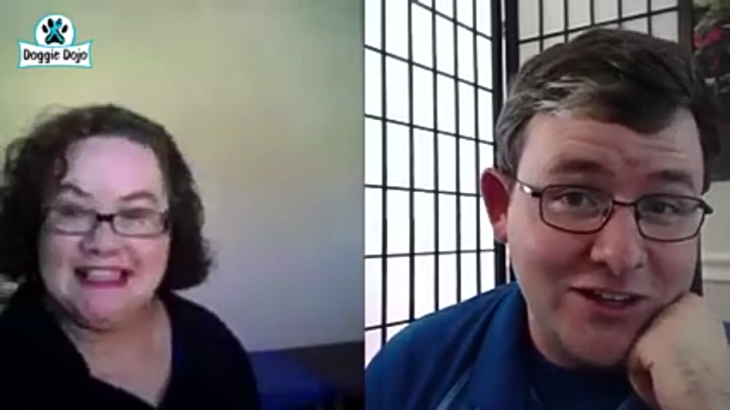 This week I had the great pleasure of sitting down and talking LIVE on Facebook with the wonderful trainer, Trevor Smith on the Doggie Dojo Show. I love having the opportunities to do things like this, not only to talk with like minded individuals, but also to communicate live with people across the world that really want to learn how to do have better relationships with their pets. For those of you that are not familiar with Trevor Smith, boy, are you missing out! His positive energy is contagious and his knowledge in training and behavior is not to be ignored. I greatly suggest joining his Facebook groups Modern Dog Training and Behaviour and the Doggie Dojo to keep abreast of all the new happenings and have the opportunity to learn from a wonderful community of individuals who practice a positve, force-free approach to dog training. Trevor and I have had fun collaborating on an amazing Instagram hashtag he began. A 100 day challenge of #lifewithyourdog. I was lucky enough to be able to share training videos for the challenge and really watch people have fun and grow with their dogs. On this Thursdays show, we had the pleasure of discussing my new book, “Hyper Dog 101” and the importance of working on impulse control. I appreciate all the great questions that came over to help shape the show as well as the amazing amount of views and shares across Facebook. Here is the link to watch the entire broadcast if you missed it and as always, thank you for everyone’s support! News & Events doggie dojo, facebook, live, trevor smith. permalink. We Are Going LIVE on Instagram! Why Go With A Certified Trainer?